The holiday season has been off to an early start this year. Under pressure from the children the decorations went up the afternoon of Thanksgiving and within 48 hours the house went from reasonably autumnal to yuletide overload. I love it of course and even if it means we’ve finally all fallen victim to the day after Thanksgiving holiday commercialism, at least we’ll go down with a smile. With that in mind, might as well fire the holiday candle full flame and head down to Longwood Gardens for an early peek at the holiday display. This wouldn’t be our first visit to the gardens during the holidays, we’ve been down before and to be honest I was a little nervous about the crowds on this trip. The last two visits managed to hit on some of their busiest days and with admission tickets sold out for Friday’s opening day I was holding my breath to see how Sunday would work out. I should have relaxed, it worked out great. We arrived around 3pm and were able to just fit into the main parking lot, showed our tickets at the gate, and then walked right in with plenty of smiles and not a single delay. The exhibition hall with this year’s focal point, a huge ivy and poinsettia tree highlighted with dozens and dozens of white moth (Phalaenopsis) orchids. I usually have a plan of what’s to be done and seen, but now that the kids are older they’re far more determined to do and see what they want. There was a much faster pace as we rushed through the displays and barely noticed much more exciting things such as orchid displays, bonsai trees and carnivorous plants. There was also this odd fascination with organ recitals and Christmas carols, of which we were required to sit (and sing) through two full showings. 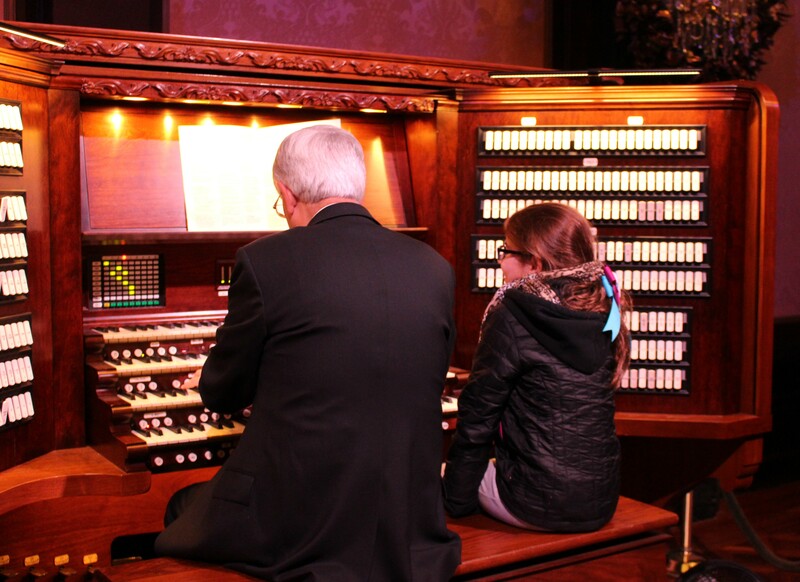 This enthusiasm must not have gone unnoticed since by the end of the second session our organist, Rudy Lucente, invited the girl up to give her a close-up of the organ mechanics. What a thrill that was for our budding musician. Rudy Lucente at the organ. So the visit took on a different tone. I did get to explore the gardens for a bit before the sun set but the visit was more about enjoying the season than it was about examining every new plant. I sometimes forget there are ‘other’ parts of the conservatory which are devoted to music and grand entertaining. Once we had a bite to eat and the sun went down it was time to re-explore with all the lights on. A Longwood Christmas inside the conservatory. I was particularly impressed with the huge hanging chrysanthemum balls. Someday I hope to get down here for that show as well, I’d love to see the greenhouses decked out in fancy autumn mums. For all the visits we’ve had this might be the first where we’ve sat through the fountain display. I’m a little embarrassed to admit that since the water, lights, and music were more impressive than I thought they could be…. did I mention I’m more of a plants person? I guess the DuPonts were onto something when they spent millions on building fountains and then inviting friends to view them. The decorated grounds are the highlight of the night though. I’d show more pictures but we really just spent our time wandering, sipping a warm drink, and enjoying the fact this was our first above the freezing mark visit. 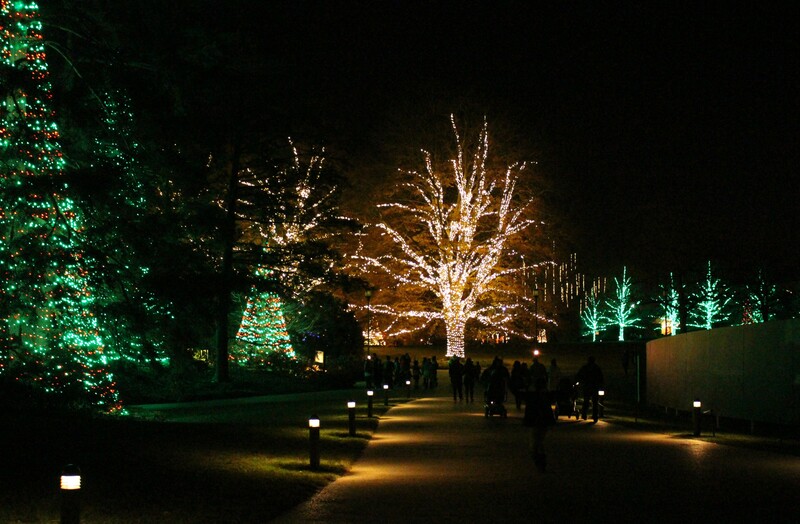 A Longwood Christmas on the grounds. Music, snacks, beverages, bonfires, and a beautiful night. What seemed like pushing the season turned out to be perfect. The two weeks since have flown by and I know this trip wouldn’t have fit in between other visits and snowy weather. Better to get it in while you can. Give >their website< a visit even if you can’t make it yourself. I’ve left out so much and their photography is exceptional. You can also easily see if things are crowded and if tickets are selling out. All the best as we begin to wrap up the year! 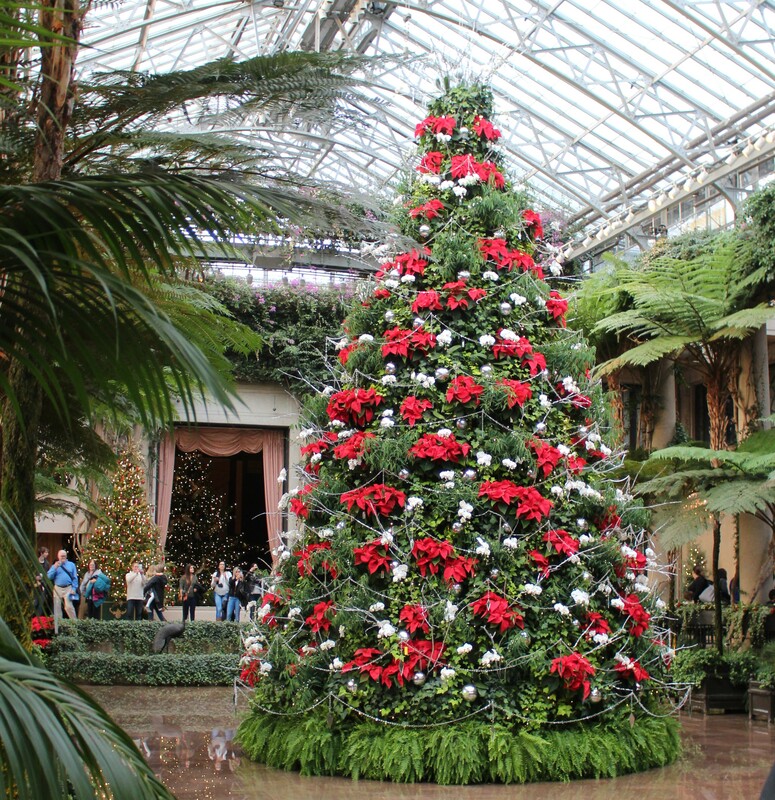 This entry was posted in garden design, garden tours, Uncategorized, winter and tagged holiday display, longwood gardens, Pennsylvania gardens. Very nice. Something new to me. Decorations well done. Lights and evergreens, not overtly religious nor commercial. I also appreciate that there are no flashing lights or animatronics! The first time we visited for the lights my son really did just wander about saying ‘wow’ again and again. It’s a great show for all ages and a good excuse to bundle up and get out for the night. 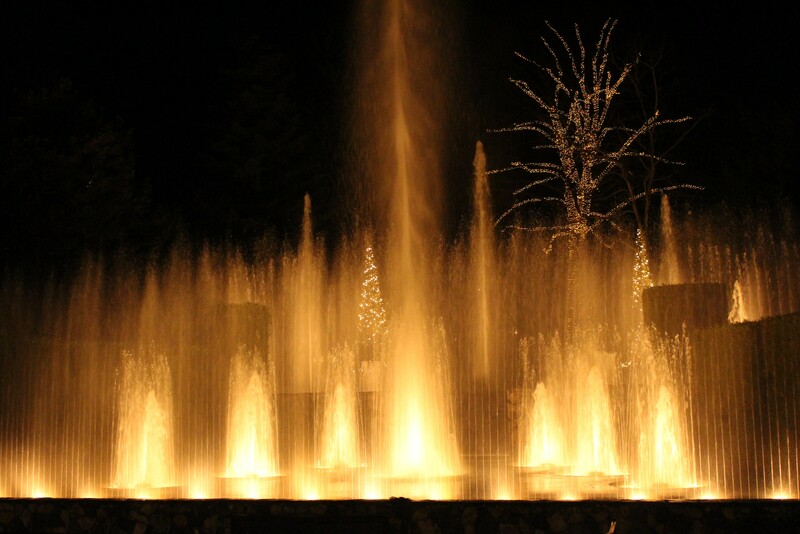 You must really be in the festive spirit now; Fountains can be wonderful, I love them when they’re done well. Thanks for sharing your experience. Yes, and with snow today it really strikes a stay inside, holiday mood. The fountains are over the top of course, nothing subtle or subdued at the formal end of Longwood, but there are so many calm woodland strolls and smaller garden niches that you can really find your own experience. We have the garden, but nothing like your Christmas markets! There was a lot of strolling going on. A nice mix of singles, couples, families, and then there always seem to be a large number of ‘fancy strollers’, I think of them as the after dinner crowd and they always make me feel somewhat underdressed! I just pulled out my photo album and realized that my son was only 6 years old when we went to see Longwood at Christmas… he’s now in his thirties! (Where does the time go?!?) Your photos are much better than ours were though. I’ve been to Longwood a couple of times since but not in the winter — I’m a bit of a wimp that way, LOL. I understand they have the nighttime light shows during the summer as well though. Have you gone to any of those? I have gone to the summertime light show, and the first time was just by chance that we stayed late enough to see the lights go on. It was amazing! So relaxing and colorful and a completely different experience with the insect sounds and warm temperatures. It was on again later last summer and I wanted to go, but you know how time flies! C’mon, with that nice new jacket you should be out snowshoeing and sleigh riding! What a lovely thing to do as a family. I hope it becomes a family tradition for your kids when they grow up. As Jane says, not overtly religious or commercial. I’m always hoping that even with things the kids are somewhat indifferent to that someday they become great memories and worth repeating. It’s all part of my evil plan to someday turn them into garden and nature lovers… and they won’t even see it coming! I have great memories of visiting Longwood at Christmas time. So lovely. Thanks, my hope is that someday my children can look back and have the same memories. It’s such a nice seasonal experience. Also nice to see so many people breaking away from their sofas to get out for a relaxing wintertime stroll. 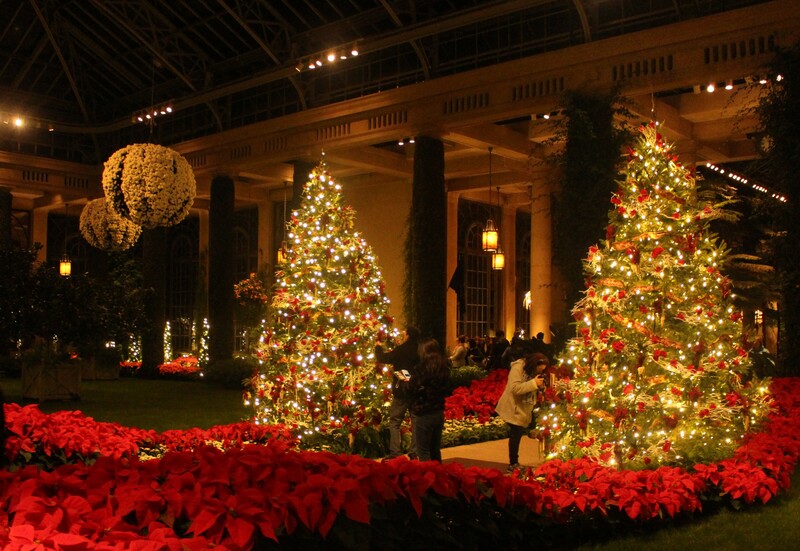 Visiting an historic conservatory was a holiday tradition I loved as a kid. I need to get into that habit again, though nothing quite as grand as Longwood hete. While growing up near NY there were a few gardens and old mansions with smaller conservatories. I really miss that now, especially in the dark depths of January where a little humid burst of flower-scented air is just what your soul needs! I am so glad you “took” me along on this trip. 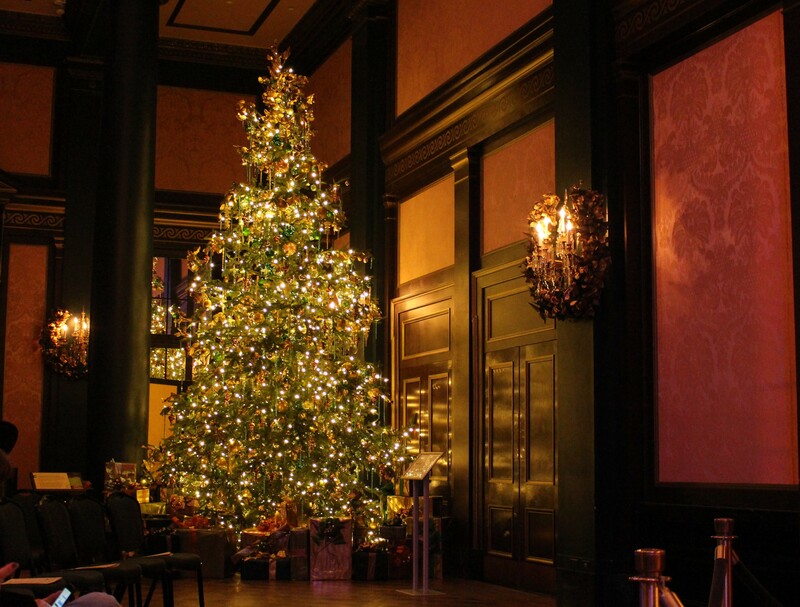 I have not been to Longwood in a few years and they do such a remarkable job at Christmas. The fountains look like a forest of golden trees. I marvel at them every time I am there. Thanks for all your wonderful photos. My holiday season is better for seeing this post. Glad you enjoyed seeing it all again. There’s only so much time to get everything done and when you’re off chasing eagles a tame conservatory trip might not fit on the to-do list! Not so. The eagles are not far from Longwood. I have made both trips during the same trip home to PA. That is when I saw Christmas there a few years ago. Different experiences, yet both thoroughly enjoyable. I have not blogged about all the gardens in that area for some time now, even though I always take photos. Haha, I don’t know how you manage to fit it all in! Not really that close, but have you ever been to Middle Creek in the spring for the snow geese? I’ve wanted to go for years but haven’t yet. I imagine it’s quite a spectacle. No I have not been there. I have read about the snow geese in such numbers. I have to visit sometime. There are some really nice preserves not far either. We see the snow geese up here in Spring, like 10,000 at a time. I tried photographing them, but was too close to get the huge numbers. I am from near Philadelphia and don’t consider much far from there. I can fit in many of those gardens into one day unless I spend all day at one. The eagles are only an hour from where I stay at my cousins too. Thanks for the holiday wishes Annette, and of course the same to you. I hope it was a wonderful season and I’m sure St Nick brought you everything you wanted! We are headed for a mid January thaw next week and I hope the plants stay asleep. Of course I’ll enjoy it, but the shock of a return to winter in February will not be something they like. I enjoyed seeing your impressions of Longwood, but you’re being awfully modest about your camera skills! Goodness, you started Christmas early. But Longwood sounds like a fabulous way to get into the Christmas spirit. I’ d love to see it in summer. Have a great festive season. I must really make an effort to visit Longwood in a new season. It seems like Christmas and June keep repeating again and again and although they are both fantastic times 2017 might be the year to make an August trip! I enjoyed this so much (even though Christmas is behind us now, I’m trying to catch up). Hope you have a wonderful new year! So far so good for the new year, hope yours is wonderful as well! Love the conservatory at Longwood Gardens. Happy New Year to you! Wow! Every time I see posts about this place it makes me want to visit. It sounds like you and your family had a wonderful visit and your photos are great! Longwood is definitely a garden destination, I hope you’re able to make it out someday…. even though you seem to be doing just fine where you are!